Land use changes in urbanization, industrialization, and agricultural processes will continue to have negative impacts on water quality at all scales. The impact of land use changes on water quality is generally studied by analyzing the relationships between land use and water quality indicators. Therefore, the purpose of this research was to review and analyze the main relationships between land use and water quality, as well as to visualize the major sources and processes of water quality pollution in Malaysia. To achieve our goal, we evaluated the significance of both land use and water quality attributes used in the past studies and correlated them to understand their relationship from another angle of view. The results revealed that 87% of the reviewed studies indicated urban land use as a major source of water pollution, while 82% indicated agricultural land use, 77% indicated forest land use, and 44% indicated other land uses. However, the results of correlation analysis showed that agricultural and forest-related activities more affected water quality through their significant positive correlation with physical and chemical indicators of water quality, while urban development activities had a greater impact on water quality through altering hydrological processes such as runoff and erosion. These findings would provide decision-makers with useful information for managing water pollution processes rather than sources only. Land use is the human use of terrestrial space for economic, residential, recreational, conservation, and government purposes. The concept of land use is closely linked to the development of the human community. Patterns of social development and land use have shaped the local and global environment since prehistoric times (Encyclopedia 2009). Current patterns of development, as well as the characteristics of the natural environment and the consequences of past development activities, determine opportunities for future development and also the need to restore or improve environmental resources (Encyclopedia 2009). Land use refers to anthropogenic use of lands and their resources, and the physical conditions of these lands result from a long-term interaction between humans and natural environment. Non-point sources are spread, cover important areas, and operate either in response to human activities or as “background pollution” of natural lands. Non-point source pollution is related to land management and geological and hydrological variables and may change daily or annually. Only land management factors can be controlled by society. Non-point sources are produced and transported as part of the hydrological cycle. Surface runoff transports eroded soil particles from porous areas. It also absorbs and transports contaminants deposited in impervious areas. Groundwater transports pollutants from septic tanks and landfills. Urban runoff contains suspended solids, metals, bacteria, aerobics, nutrients, and fats. Sources of these pollutants comprise vehicles, fertilizer and pesticide applications, animal manure, construction activities, and road pickling. Non-urban pollutants are often associated with agricultural activities. Agricultural pollutants comprise pesticides, sediments, nutrients, and organic substances. The NPS load in agricultural areas is usually seasonal, with higher loads associated with planting and harvesting activities. Furthermore, land use changes in the process of urbanization, industrialization, and agriculture can change the surface characteristics of watersheds that affect the quality and quantity of runoff. The impact of land use changes on water quality involves association of land use and water quality indicators (Tu 2011). Many studies have shown that there are significant correlations between land use and water quality indicators (Baker 2003; Buck et al. 2004; Li et al. 2008; Tong and Chen 2002). These studies of relationship between land use and water quality through various means and approaches have permitted to estimate and understand water quality in rivers distressing from diffuse pollution. In general, the higher percentages of land use associated with human activities and economic development in watersheds are often interrelated with high concentrations of water pollutants, while undeveloped areas such as natural forest areas are linked with good water quality. However, knowledge in such relationships at a catchment scale across seasons is still lacking due to the large area and monitoring difficulties (Rodrigues et al. 2018). In Malaysia, pollution of river waters poses a serious risk to the health of the public. River water quality monitoring is the responsibility of the Department of Environment (DOE) in Malaysia. According to DOE (2018), the monitoring program of DOE began in 1978 for Peninsular Malaysia. In 1985, Sabah and Sarawak were included in the monitoring program, and this was followed by the Island’s Marine Water Quality Monitoring Program in 1998. Currently, 233 coastal and estuarine monitoring stations are established in all states of Malaysia and 73 islands with 86 stations for the island monitoring program DOE (2018). These islands are categorized into four, namely, development islands, resort islands, protected islands, and marine park islands. The monitoring program includes in situ measurements of water quality parameters such as pH, temperature, dissolved oxygen, turbidity, conductivity, and salinity, as well as laboratory analyses of parameters such as Escherichia coli, cadmium, copper, mercury, and lead. The sampling frequency is between four and six times a year. This monitoring activity provides important information on the state of water quality of different water bodies (DOE 2018). This research is motivated by the fact that human activities such as rapid urbanization, intensive agriculture, and deforestation in Malaysia have increased land use changes and their impacts on water quality all over the country. As such, many studies have been conducted to address these problems; therefore, this research was necessary to accommodate the main findings of those previous studies, in order to facilitate researchers to identify specific areas requiring improvements and priorities. Razali et al. (2018) reviewed case studies of land use change in highland areas and its impact on river water quality, and their study was limited to the river system network in the Cameron Highlands in Malaysia. However, the purpose of the present research was to review and analyze the main relationships between land use and water quality, as well as to visualize the major sources and processes of water quality pollution in Malaysia. In order to identify the relevant existing literature in accordance with the purpose of this study, a rigorous review of all applicable studies conducted in Malaysia until mid-2018 was done. The literature search was conducted in the main scientific databases, including Scopus, ScienceDirect, Springer, Google Scholar, and EZproxy from Universiti Putra Malaysia (UPM), with the following keywords: Land use, water quality, and Malaysia. 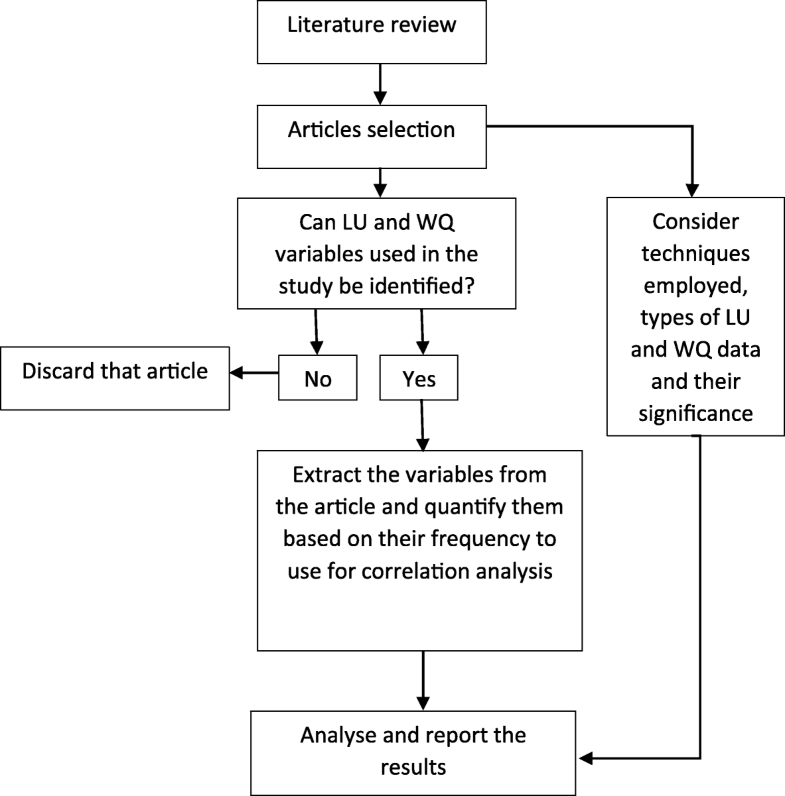 From this search, the focus was on the articles that enabled to identify both land use and water quality variables utilized in the different studies (Fig. 1). In total, 39 of 52 analyzed articles made it possible to extract the needed information. In this study, we addressed the relationship between land use and water quality variables by checking how the attribute variables were correlated as extracted from the literatures examined over a 10-year period (Figs. 3 and 4). After quantifying the attribute variables, we chose to use the Spearman correlation coefficient instead of the Pearson correlation coefficient which is the most common for continuous data. However, the study involved no data collection or laboratory water quality analysis. In this study, the land use attributes were grouped into three major categories according to level I from Anderson (1976) classification scheme. Urban land includes residential (built-up), industrial, commercial, and recreational areas; agricultural land comprises oil palm and rubber plantations, croplands, pastures, and other farming areas; and forest land involves logging area, mangrove area, and wetland. On the other hand, water quality attributes were grouped into four types: physical, chemical, biological, and hydrological. However, for the sake of simplification, water bodies, barren land, and abandoned/mining areas were all grouped into one category (Fig. 3). These types of land use were not discussed in the findings due to the insignificance of literatures containing them. Field measurements and laboratory analyses are the main methods for generating water quality data of respective water bodies. However, several studies, in addition to the data collected in the field, have used data generated by the Department of Environment (DOE) in Malaysia. The DOE sampling frequency is between four and six times a year. Moreover, various techniques have been applied in assessing and understanding the relationship between land use and water quality in different watersheds in Malaysia (Table 1). These techniques include multivariate statistics (e.g., Chow et al. 2013; Ngah and Yusri 2007), remote sensing and geographic information systems (GIS), and hydrologic/water quality modeling (e.g., Azyana and Na 2012; Vijaindra et al. 2003; Sakai et al. 2017). These techniques are commonly used for regulatory, monitoring, planning, and exploration purposes. However, the overall results of the papers analyzed in this study indicated that most researchers used modeling rather than monitoring techniques to determine the relationship between land use and water quality. These results are in line with the finding of Abdulkareem et al. (2018) who highlighted the growing of modeling approaches among Malaysian researchers to address a variety of water-related issues in Malaysia. Furthermore, in establishing the relationship between land use and water quality, modeling techniques may have some advantages over other techniques due to their suitability in relating the phenomena. As such, statistical modeling may be preferable to physical-based modeling because of the need for a large number of input data associated with continuous observation data for the model building, calibration, and validation process (Giri and Qiu 2016). It was found that the rivers with industrial land use setting recorded the highest pollution level, followed by both plantation and all recreational rivers, while less disturbed rivers recorded the lowest level of pollution. The results of this research show that water quality characteristics in Penang Island are strongly influenced by land use surrounding the rivers. The results of the analyses indicated that Land Use Land Cover (LULC) changes have significant impacts of water quality in the study area. The results revealed that as activities increased throughout the watershed, the quality values of the WQI decreased accordingly. The results of the WQI predicted using the WQI-LA showed a continuous decrease in water quality. Results from previous researchers have underlined that factors such as soil erosion, landslides, agricultural activities, urbanization, and unplanned developments associated with land use change have significantly influenced the quality of river water in mountainous areas. The relationship between land use and water quality shows that urbanization is a determinant of river water quality, followed by anthropogenic horticultural activities (rural areas) often located near rivers. The results show that in hilly terrain, even heavily logged rainforest is essential to preserve water quality and reduce erosion, while oil palm requires careful soil management, particularly runoff roads and ground cover. It is found that due to rapid changes in the watershed, the hydrology and morphology of Pusu has changed dramatically. The results indicated that the development of land use activities in the Tanah Tinggi Lojing area has affected the water quality parameters in the area. This study shows that water quality at stations around urban and agricultural areas is deteriorating. Several techniques have been applied in assessing and understanding the relationship between land use and water quality in different watersheds in Malaysia (Table 1). The results clearly showed that land use activities have significant impacts on water quality (Fig. 2). This is in part due to the rapid and continuous development that the country was experiencing over the last decades. These development activities are sources of water quality degradation in various water bodies through different processes (Table 2). Of the point and non-point source pollution, NPS pollution is a major concern because of its complex nature (Giri and Qiu 2016) and includes agricultural and urban land use activities, deforestation, and other environmental problems. These effects are generally studied by analyzing the relationships between land use and water quality indicators. Several studies have been conducted to match these indicators (Table 3) and analyze the cause-and-effect relationship between them. The following sections discuss the correlation between each major land use category and the types of water quality indicators used in the different studies conducted in Malaysia over the years. Temperature, electrical conductivity (EC), total suspended solids (TSS), turbidity, total dissolved solids (TDS), etc. Heavy metals, pH, biochemical oxygen demand (BOD), chemical oxygen demand (COD), dissolved oxygen (DO), nitrate, etc. Escherichia coli (E. coli), Ephemeroptera, Trichoptera, Coliform bacteria, sea urchin, etc. Water level, depth (m), velocity (m/s), flow direction, discharge, etc. The clearing activities of land can lead to increased salinity problems in a catchment and the export of sediments and the decomposition of organic matter in streams which can lead to acidity problems in the catchment (such as low pH, increased total acidity, and mobilization of dissolved heavy metals) (Fig. 2). Stock control activities, such as feedlots, can result in increased organic matter in local streams, which have a similar effect on water quality like a wastewater treatment plant (WADW 2009). As such, most researchers have focused on the effects of agricultural land use on water quality in addressing water quality issues in Malaysia. About 82% of the articles analyzed in this report involved agricultural activities as a major source of water quality degradation (Table 3), and most studies have addressed this issue in 2015 and 2017 (Fig. 3). The results of the correlation analysis showed that there was a significant positive relationship between agricultural activities and the physical and chemical characteristics of water quality (Table 4). The physical parameters identified in the various studies for this research include temperature, electrical conductivity (EC), total suspended solids (TSS), turbidity, and total dissolved solids (TDS), and the chemical parameters include heavy metals, pH, biochemical oxygen demand (BOD), chemical oxygen demand (COD), dissolved oxygen (DO), and nitrate. In addition, these water quality indicators have been the focus of most studies in Malaysia (Fig. 4). This may be due in part to the fact that these parameters are composed of the elements used to determine the status of different water bodies in Malaysia using the DOE Water Quality Index (DOE-WQI). Furthermore, although a positive correlation between agricultural land and the other parameters was observed over the past years, this relationship was not significant across the different studies (Table 4). Water quality is affected by human interference related to urbanization, such as industrialization and the increase in housing development (Fig. 2). In Malaysia, many researchers have studied the impact of urban land use on water quality over the last decade. As such, agricultural and urban land use factors have been the focus of most studies dealing with water quality in the country. 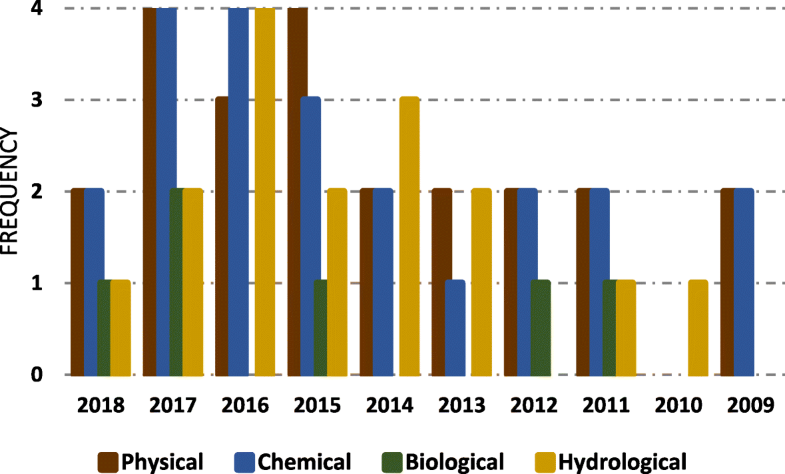 The results of the papers analyzed in this study indicated that the main sources of water quality degradation in urban areas include various activities, such as residential, industrial, and commercial, as well as recreational activities (Fig. 2). Consequently, urban development has become a significant predictor of water quality changes in Malaysian rivers (Fig. 3). For this reason, Azyana and Na (2012) concluded, after their study on the degradation of water quality in the Kinta River, that developed lands were found to be the best indicator for predicting water quality degradation. Nurhidayu et al. (2016) suggested a more effective land use planning method that takes into account the impacts of accelerated sediments from converted land use to ensure the protection of the environment. However, based on the significance of data used in the past studies, urban land use showed the most significant positive relationship only with hydrological parameters (Table 4). These parameters mainly include water level and depth, velocity, flow direction, and discharge, in relation to water pollutants’ fate and erosion patterns. The strong positive correlation between urban land use and hydrological parameters, as identified in this study, confirms the finding of previous studies indicating the cause-effect relationship between urban developments and changes in the hydrological regime. Without human intervention activities, natural forests would have no significant adverse impacts on water quality. In fact, these forests contribute to maintaining the quality of surface water in particular. As such, in their study, Nainar et al. (2017) underlined some contributions of rainforest to the preservation of water quality and reduced erosion. 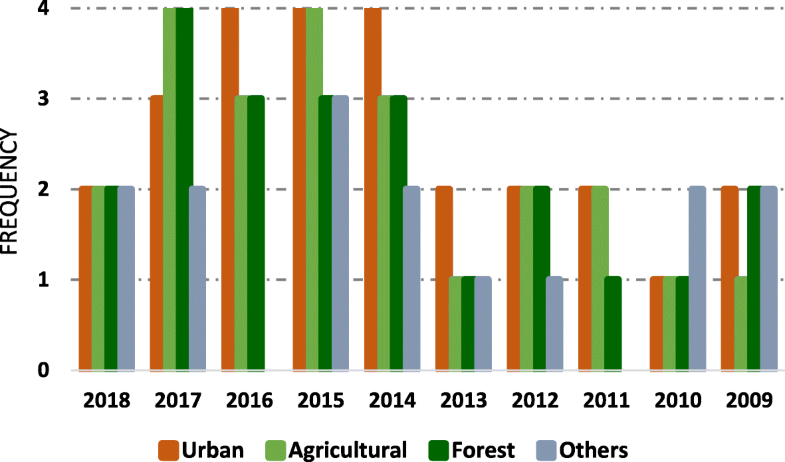 However, the results of many articles analyzed in this study indicated that forest areas are gradually decreasing in Malaysia, mainly due to the conversion actions to either agricultural or urban development activities. For this reason, about 77% of the reports analyzed in the present study have more or less focused on the effects of deforestation (logging activities) to surface water quality in Malaysia (Table 3). The results of correlation analysis between land use and water quality attributes also showed a significant positive association of forest land areas and changes in physical and chemical parameters of water quality in the country (Table 4). In addition, there was also a significant positive correlation between urban, agricultural, and forest areas on the one hand, and between physical and chemical indicators of water quality on the other hand. Indeed, these variables were primarily responsible for understanding the effects of land use on water quality in Malaysia. However, many researchers suggested sustainable management of mangrove areas and logging activities in order to achieve sustainable development and a better understanding of effective water conservation and management. Factors affecting water quality in developing countries are complex and their sources have been described in many literatures. However, most of these literatures have not touched on their processes, especially with regard to surface water pollution. Therefore, this research was needed to review and analyze the existing studies in order to provide a clear summary of the main sources of water pollution and to understand the processes involved. The results of the reviewed literatures revealed that urban development, agricultural activities, and forest degradation are the main sources of water quality deterioration in Malaysia, with 87% of studies indicating the impact of urban land use, 82% of agricultural land use, 77% of forest land use, and 44% of other land uses. 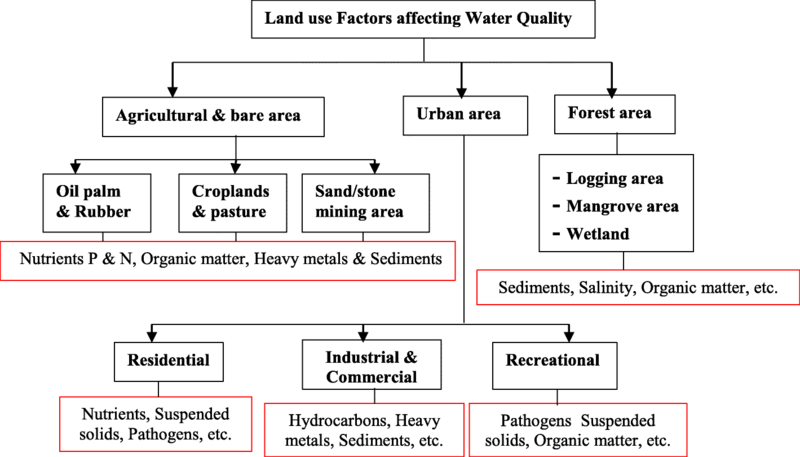 As a result of human activities, the effects of these land use factors on water quality have been understood through the processes linking them to the water quality indicators as described in the previous sections. For example, urban land use activities have a greater impact on water quality by altering hydrological processes, and agricultural activities and forest degradation were strongly correlated with physical and chemical parameters of water quality. This understanding of the relationship between land use and water quality would facilitate the management not only of the main sources of water pollution, but also of the processes involved. The authors thank the Sultan Abdul Samad Library of UPM for providing the resources used in this study. Financial assistance for this research was provided by the Department of Environmental Sciences, Faculty of Environmental Studies, Universiti Putra Malaysia (UPM), Malaysia. All the data used and analysed in this study are included in this manuscript. NRJ supervised the research and approved the findings. CM carried out the research and analyzed and reported findings. AFBA verified the reference sources and approved the analysis procedures and the results. All authors read and approved the final manuscript.